The sound you hear is my heart still pounding in my chest. This is what a tight script, taut direction, tension-building editing, and a two-thirds-terrific – and sometimes terrifying – movie looks like. There is little blood, no ghosts or vampires or other-worldly creatures, no chainsaws, long bloody knives, or men in Halloween masks; there is just a woman on the phone, a young girl in the trunk of a car, an evil man at the wheel, and a number that brings them all together: 911. ‘The Call’ is a straightforward story made suspenseful by strong writing and committed performances from a small cast in a setting that feels very realistic and informative. 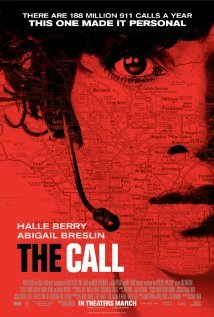 Halle Berry finds the empathetic humanity in her character as Justin, the 911 operator; Abigail Breslin is convincing as a girl kidnapped, freaking out and terrified of where she’ll end up; and Michael Eklund is somewhere near perfect as the slimy and sweating perpetrator. So all of that makes this a terrific movie…but then comes the third act where the movie takes a ‘left turn’ onto the Street of Implausible Plots. What the first two acts built up, the third act unravels. And all of that weakens what is otherwise, a really good and suspenseful film. Still, if you like suspense, this one will bring chills – and a racing heart.